The Virtual CoLab Project is researching how mathematicians (as well as other scientists and professionals) can use 3D virtual environments to collaborate and communicate with each other, even when they might not be situated in the same physical location. 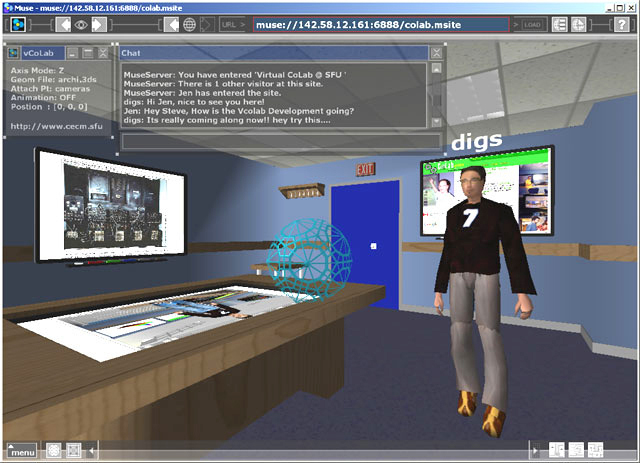 It uses 3D environments with rich media objects (browsers, video, 3D models, animation), avatar embodiments and spatial user interface constructs to create a shared experience that gives the remote participants a sense of tele-presence – a feeling that they are “there” in the same place with others. We are experimenting with virtual social and information environments connected amongst themselves (all multi-user virtual spaces) as well as existing along side and in connection with a physical collaborative room. collaborate with his peers located in the physical colab. 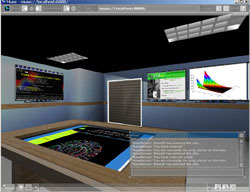 The current setup uses a windows-based free client tool called Muse (www.musecorp.com) which is an open, component-based, extensible software architecture that presents the developer with the possibility of creating immersive 3D environments that unite video and animation, audio, 3D models, and multi-user capabilities. The Muse architecture which is built on standards like OpenGL, Tcl and XML promotes rapid development and provides a flexible foundation for incorporating current and emerging technologies. 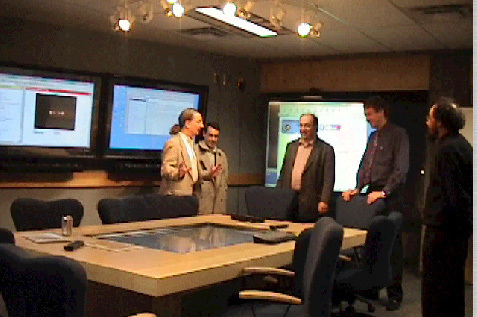 Our first 3D environment is a virtual replica of the SFU CoLab room (picture above) where web browsers kiosks stand in for the physical CoLab’s smart-board PC displays. We are now investigating how individuals in the physical CoLab can collaborate with remote colleagues who login to the Muse based virtual CoLabs from their PCs. The hope is that researchers in the near future will have the option, when they want to collaborate with peers, to travel the nearest physical CoLab room (at say a major university in the area), or choose to participate online in a virtual coLab with simple software and an available PC setup. We are also building flexible virtual environments that can be tailored for specific collaborative goals, where the setup and functional (how many kiosks situated in what type of organizational relationship for instance) depend on the desired outcome or process. For instance you would have markedly different setup of the informational environment for a group of researchers who are planning a early stage brainstorming session compared to say a situation where a mathematician was giving a educational tour through a solved problem for those new to it. Our interest is to analyze which setups work best for specific goals and also compare similar analysis being performed at the physical CoLab room with that of the virtual setups. Initial design of the Muse software is by Muse where DiPaola was one of the main architects. He and other researchers at SFU continue to work with (the open architecture) Muse (as well as other systems) from a 3d UI and virtual environment perspective. The virtual coLab project was part of Simon Fraser University’s Center for Constructive and Experimental Mathematics Research Lab and its CoLab research lab under Jonathan Borwein. Steve Dugaro is a graduate student there, and was the prime implementor of the vCoLab. SFU vColab Downloads WebLink: SFU CECM coLab Download Page for the virtual coLab discussed here. CECM Page WebLink:SFU Center for Constructive and Experimental Mathematics. SFU coLab Page WebLink:SFU Colab web site – Mathematics Dept.